This combination of ingredients was from an old roommate of mine. It makes a great snack that everyone loves and isn't high in calories. 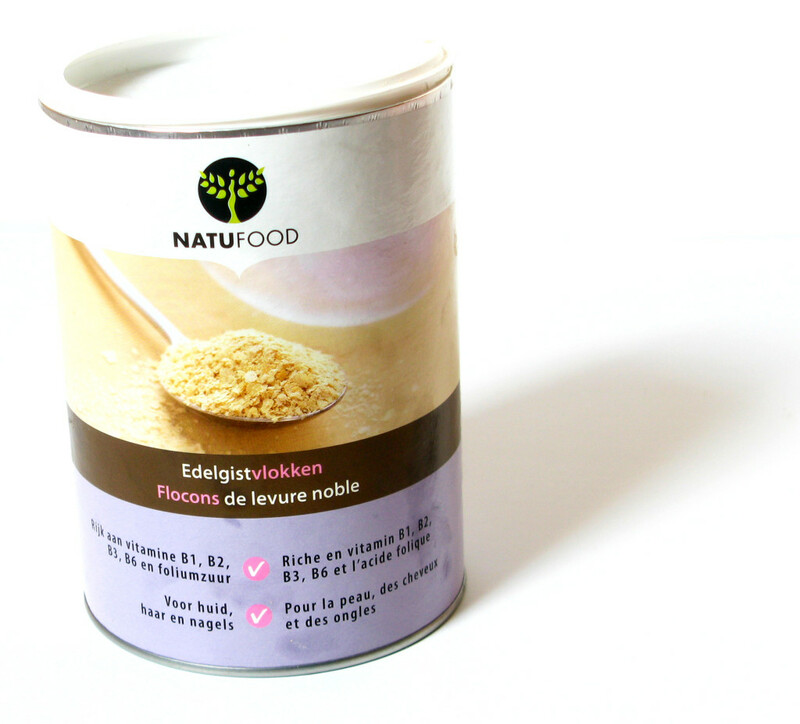 Nutritional yeast is a light deactivated yeast that has a delicious, nutty, cheesy flavor. This is not the yeast used in baking! Here is a great article to read more about nutritional yeast. Step 1 To a heavy, cast-iron pot add the oil and three popcorn kernels on a medium-high heat. Step 2 After all three kernels have popped, add a couple of handfuls of popcorn kernels and cover the pot. 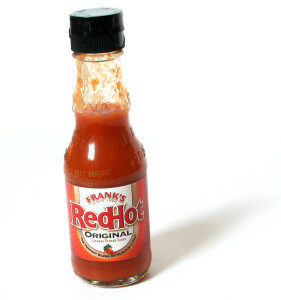 Don't leave a gap with the lid, make sure it's on properly to keep the heat and steam in. Step 3 As soon as you hear popping noises, give the pot a good shake and put it back on the heat. Repeat until you don't hear popping noise anymore. 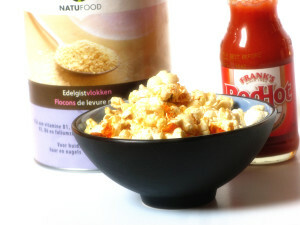 Add the nutritional yeast and S+P. Toss or stir to coat the popcorn. Then, devour. This entry was posted in appetizers, Food, home + garden, Snacks and tagged Franks hot sauce, nutritional yeast, popcorn, snack on 27 April 2014 by peas. Step 1 Cut the sweet potatoes, but not too thickly or thinly —leave the skin on if you wish. Step 2 Immerse cut sweet potatoes into a microwaveable bowl of hot water. Microwave on high for about five minutes. You don't want the sweet potatoes to cook and get soft...it's just to get the cooking process started. Step 3 Drain the water from the sweet potatoes, but don't dry them off. You will need the excess water still clinging to the potatoes to adhere to the dry ingredients. Mix all of the dry ingredients in a bowl. 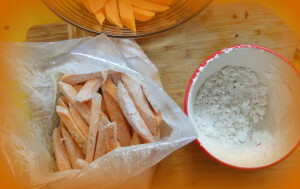 Then add a handful to the bag along with a couple of handfuls of the uncooked, damp fries. And shake, shake, shake until the fries are coated. They should be lightly coated, not glommy. 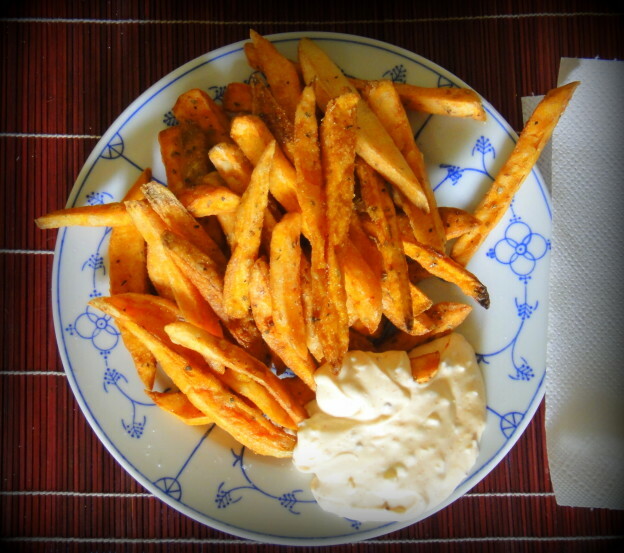 Now, you can either deep fry the sweet potatoes or bake them in a 425°F/ 220°C oven. My experience shows that with the oven method, you will have to turn the fries and monitor them for done-ness. It takes a long time. Anywhere from 20-45 minutes. I hate to admit it, but the deep fry route works a lot better and (of course) tastes a lot better than the oven method. 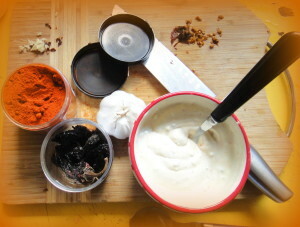 Mix together all of the dip ingredients and adjust to taste. 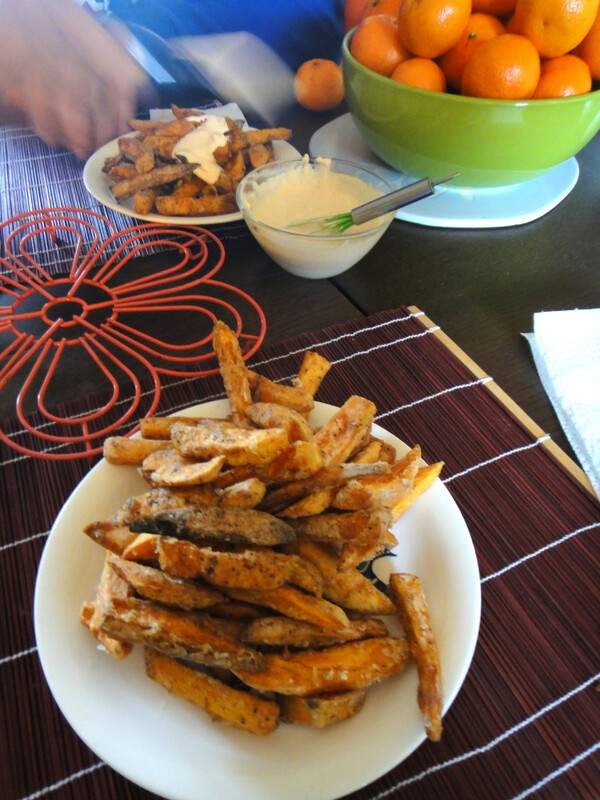 This entry was posted in appetizers, Dips, dressings + sauces, Food, home + garden, Meal, Snacks and tagged appetizer, chipotle dip, chipotle peppers, fries and mayo, side dish, snack, sweet potato fries, yam fries on 27 February 2014 by peas.